PERHAPS it’s a case of saving the best for last. Across the country fans of all things Volkswagen are being asked to give the new Golf a go, but in doing so they’re missing out on the outgoing model’s finest moments. The sixth generation of Germany’s bestseller wasn’t exactly left wanting for kudos but that hasn’t stopped the company from making sure it goes out with a bang rather than a whimper in the shadow of the slightly longer, roomier and sturdier new model. The Golf GTI Cabriolet covers two bits of automotive territory VW’s awfully good at; the hot hatch, which it’s been doing since the original Golf GTI of 1977, and the solidly-built ragtop beloved of middle class families everywhere. Step aboard and it’s business as usual for Golf lovers; detractors might call the interior dull, but Veedub fans will be delighted by the seemingly unbreakable build quality and the nice visual flourishes you get with the tartan seats and the subtle red stitching. It’s also definitely a ragtop in the traditional sense- no folding metal roof here, sorry – but that’s no bad thing because it a) keeps the boot free for things such as luggage and b) keeps the weight down, which means the performance familiar to fans of the GTI hatchback is still there in abundance. All of which means you can enjoy this car’s best feature – its engine, which thanks to having two litres and a turbo to call upon can muster up 208bhp. 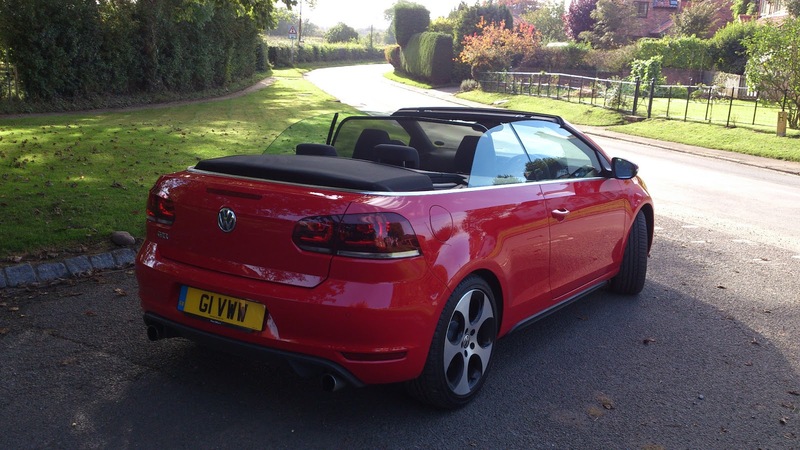 It’s a fabulous bit of hardware which not makes this open-top Golf fast enough to wear the fabled GTI badge with pride but is smooth, rev-happy and happy to play along with enthusiastic driving. But you can get this engine in the hatchback, which offers more practicality and ever so slightly sweeter handling for £3,000 less than this cabrio’s £30k pricetag. Look at this car as an open-top hot hatch and you’re missing the point, because it’ll almost certainly seem too expensive. See it as a classy, go-faster cabrio that neatly fills the gap left by Saab’s 9-3, however, and it’s a very tempting prospect indeed.